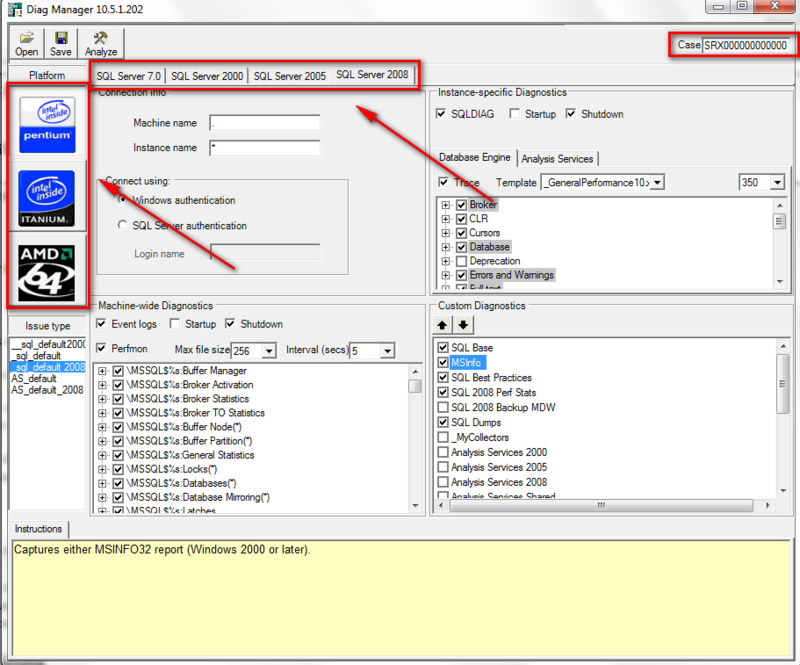 Today I am going to share a completely new tool that has been released last couple of weeks. 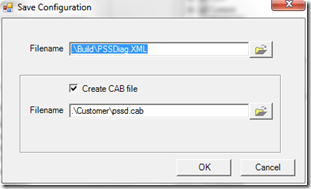 The tool is called “ PSSDIAG/SQLDIAG Manager”. The tools is aiming at providing graphical interface for configuring custom collection sets for SQLDIAG and PSSDIAG utilities. Those two utilities are used for collecting performance and statistic data by Microsoft. I will talk further more on those tools, their aim and how to use them, but it is going to be in another post. For now I will stick to the new tool I am completely thrilled by. I was kind of amazed seeing on top left corner a small edit box for the MS Case that the configuration is prepared for. This will not be used by the general DBA however it surely shows that the tool is the same as the one MS Engineers are using (used or modified). The important thing here is the Machine name and Instance name configuration. It is important to enter specific instances if you are troubleshooting a server with several instances. Machine name can come useful when you are collecting information for SQL clustered instance. 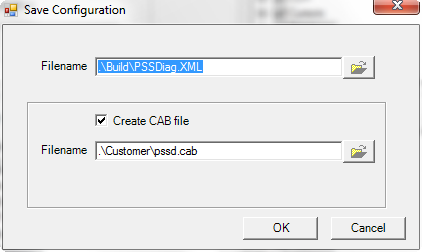 You have the possibility to just have the XML configuration file and use it directly or generate a CAB file which will include everything needed for immediate execution and starting of the collection on the specified instance. Personally I prefer using the CAB file as it comes with several other scripts/configurations. 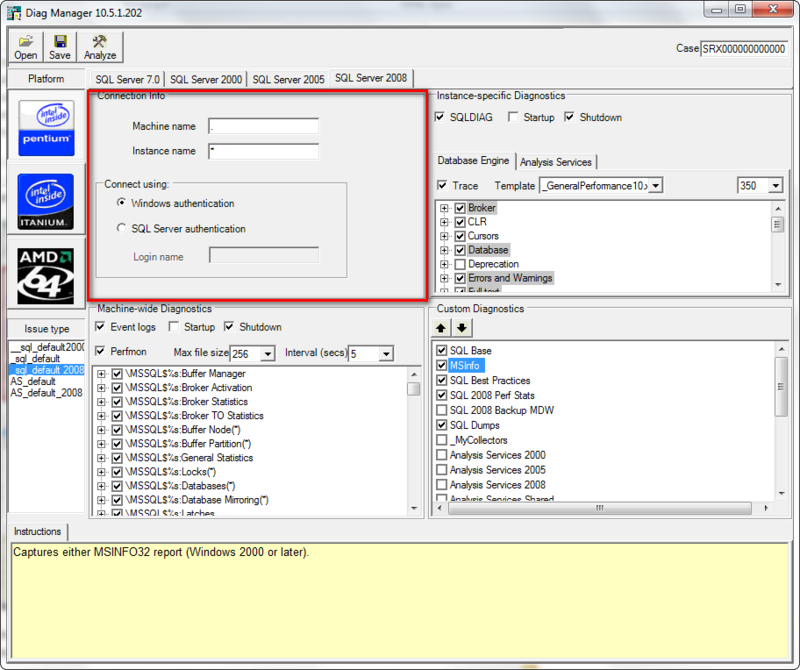 Well from now on you can just enjoy configuring SQLDIAG and generate your own investigation templates and scripts. Even if you are not that keen on altering defaults you can still use the tool for entering Machine and Instance name if you need to. I have to say that with this tool Microsoft have a complete set of tools for performance analysis that are easy to use configure and analyze. I am planning to do another post for those tools so you can have the big picture in place (if you already don’t have it). So stay tuned!